Some prices are negotiable and multiple purchase prices may be available, as we strongly believe that no mini should be alone. 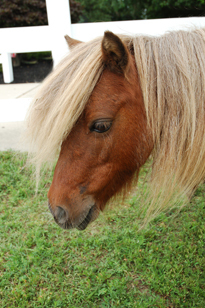 Adult miniature horses are sometimes available too. be happy and properly cared for in their new homes. We reserve the right to remove any horse from our sales list without notice or reason. Please check back with us, as colorful babies are expected soon. AMHA/AMHR( Pinto eligible) black pinto colt foaled 4/14/12, out of my Hemlock Brooks Silver Legend daughter, sired by black pinto stallion Havencrofts Phantom Warrior. This colt will mature 31"- 32". Jagger has one ice blue eye. He has a correct bite and nice straight legs. Jagger has flashy color and will stand out in the show ring. This colt has personality plus and is in your pocket friendly. Jagger is first to the gate to greet you and demands attention. He is UTD on vaccinations, hoof trimming etc. Jagger has beautiful movement and will be a terrific driving prospect. Driving is in his blood, as his sire, Phantom ,is a great driving horse and Jagger's grandsire on top is a HOF in driving. Horses are sold "as is" and are represented to the best of my ability. Please feel free to have a "vet check" at your own expense. Deposits are non refundable and all sales are final. ROKO Miniature Horses "The American Miniature Horse Association"